Chess pieces commonly use as chess game. If you use your chess pieces for chess game, then you also need chess board or chess table. We present chess pieces in various sizes, from 8 inch, 12 inch, 24 inch and so on. So you can choose one of size for your game. For outdoors game, like at your garden, at the yard, at beach, or another outdoor space; you can choose the large chess. It very perfect for having outdoors chess with this kind of chess. 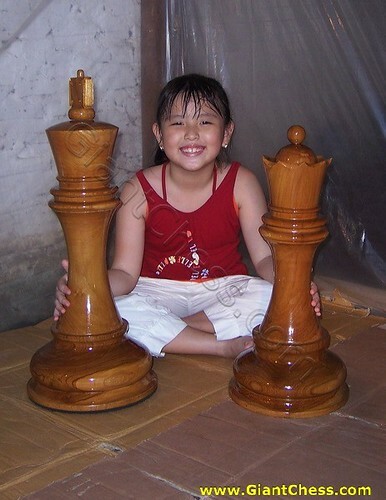 Here, we have large chess pieces that can use for outdoors chess game. You can also get the chess board for outdoors to complete your game. Beside that, you can put down your large chess pieces at your garden as decoration. It would be very unique and nice to use it as outdoors decoration. You do not need to worry about its quality. Our products are made from Teak wood, the best material from Java island. The teak wood has dried and processed in quality way. So our product is very durable for outdoor and indoor use and in any seasons.